The trophy presented to the 2018 Tour de France winner Geraint Thomas has been stolen from a temporary exhibition in Birmingham. 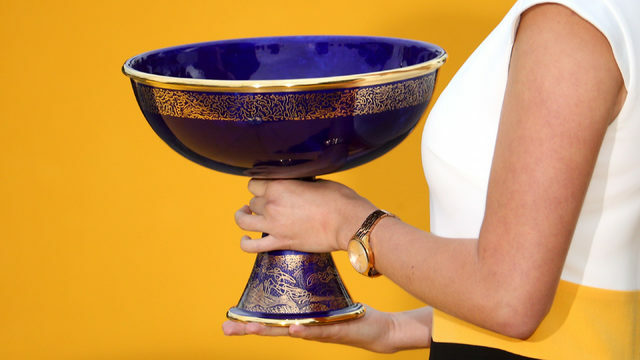 The trophy is a handmade porceline bowl on stem, hand painted and decorated with gold trim, and made in the legendary French ceramics heartland of Sevres. The trophy disappeared during a cycling show at the NEC Birmingham where Thomas's team, Team Sky, were exhibiting it along with two other Grand Tour trophies won by the team. Co-incidently, Birmingham was also the location for another famous trophy theft when the original F.A. Cup was taken from the window of a shop in 1985. That silver trophy, which had been made in Birmingham and was won that year by the city's Aston Villa team, was never recovered. It remains to be seen whether the 2018 Tour de France trophy will be returned or found, but at least it is possible to obtain a replacement. The trophy is actually called the 'Coupe Omnisports' and was designed in 1971 by illustrator and engraver Roger Vieillard. As its name suggests, this trophy was awarded for a multitude of different sports and achievements, and was first presented to Tour de France winners in 1975. Since then a new iteration of the same trophy has been presented to the tour winner every year, except 2013 when Chris Froome received a unique, larger version in recognition of the centenary of the Tour de France. The trophies, along with smaller versions, are all still crafted in the same state-owned Sevres workshop and continue to be used for a range of sporting and official presentations. Commenting on the disapparance of the 2018 Tour de France trophy, Geraint Thomas said: 'It goes without saying that the trophy is of pretty limited value to whoever took it, but means a lot to me and to the team.' In fact the resale value of these beautiful trophies may be even lower, as in 2010 a full-size version awarded to powerboat racer Robert Spalding in 1985 was put up for auction and sold for just £168. For Spalding, and for Thomas and his team, we're sure the value is priceless. For a choice selection of universal Crystal Awards Trophies or traditional silver trophy cups visit awards-trophies-supplier.co.uk.